Summer is almost over, and I have really mixed feelings about it this year. I’m actually a bit excited, because it’s senior year! However, I am also dreading writing tons of supplement essays and narrowing down the list of 30 colleges that I currently have (seriously, applying to that many schools would cost so much money and not to mention it would be impossible to make a decision!). I have 5 public universities on the list (on both coasts, by the way), a few tiny liberal arts schools, also on both coasts, city schools, middle-of-nowhere schools, midwestern schools, Catholic schools, private schools, extremely selective schools (ahem, Princeton- you know I love you! ), and less selective schools. Also, I don’t really know what I want to study. I have two college guides sitting by my bed, and I am hoping by the process of osmosis Mr. Fiske’s wisdom will enlighten me. I am extremely jealous of people who have their college list finalized. Normally I (Celine) am not indecisive at all, but not this summer! 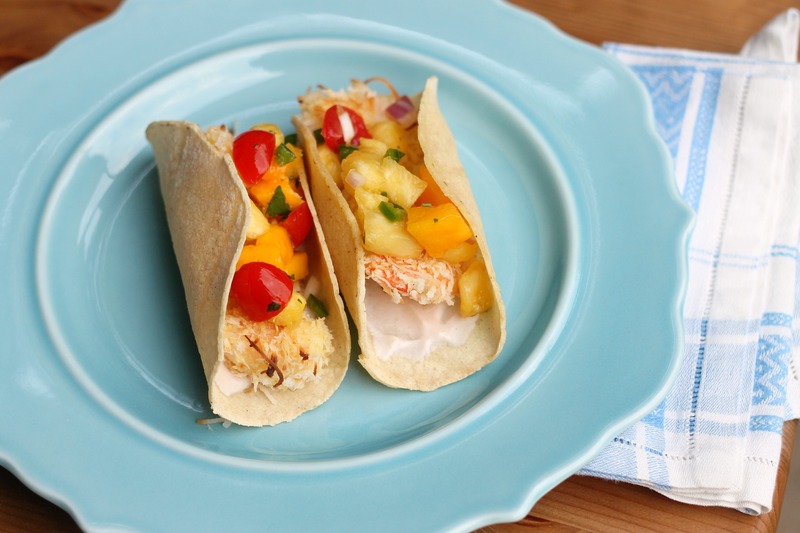 Thankfully, there have been a few decisions that have not been hard to make at all, like making these tacos! As soon as Leah and I brainstormed this recipe, we knew we had to make it. It turned out to be a very good decision. 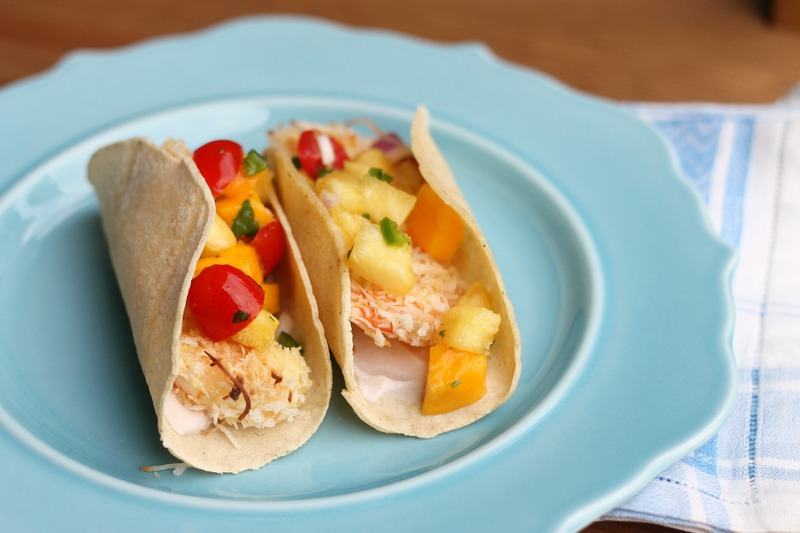 These tacos have a tropical flavor thanks to the coconut and the mango and pineapple. They have just the right amount of spice from the sriracha and jalapeno, but the sweet fruit helps balance it out. We made homemade taco shells, which were pretty good, although they are not required. Our mom especially loved these tacos, but they were a hit with nearly everyone in our family. They are fairly simple to make and are healthy. We hope you will try these out sometime soon! Dice the mango and pineapple. Combine with the rest of the ingredients in a bowl. Season with salt to taste and refrigerate until serving. Preheat the oven to 400 degrees. Line a baking sheet with foil and spray with nonstick spray. In a bowl combine the eggs and milk. Put about 1/2 inch of flour into a pie plate. In a medium bowl, combine the coconut, panko, and cayenne pepper. Dip the shrimp into the flour, then the egg mixture, and then the coconut mixture. Put the shrimp on the prepared baking sheet and repeat with the rest of the shrimp. Bake for about 8-10 minutes, or until the shrimp is pink and cooked though and the coconut is lightly browned. While the shrimp bakes, combine the sriracha and sour cream. Season with a bit of salt. In the bottom of each taco shell, spread a bit of the cream sauce. Add a couple shrimp and a spoonful of the salsa. Serve immediately. Enjoy!